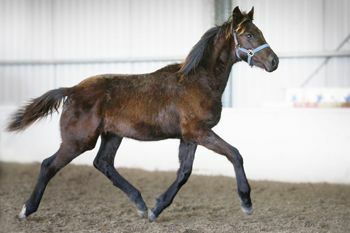 Fireworks R is a spectacularly bred young colt. The photo in the catalogue is extremely disappointing, however it is all we have and so hopefully it is better than nothing. Fireworks R is really, really quiet, also really really sensible -so much so that he is quite difficult to excite to a point where he is inclined to show off his paces. Fireworks R has amazing paces, quite extraordinary with amazing high knee front leg action, really good hind leg action and a wonderful uphill way of carrying himself. It is a really Dutch way of going, although he has inherited the Florestan I bombproof temperament. This would be the first time we have experienced such a laidback character with such �out there� paces! Fireworks R is by Fiji R who is having enormous success at medium level dressage ridden by young rider Breanna Tillitzki. 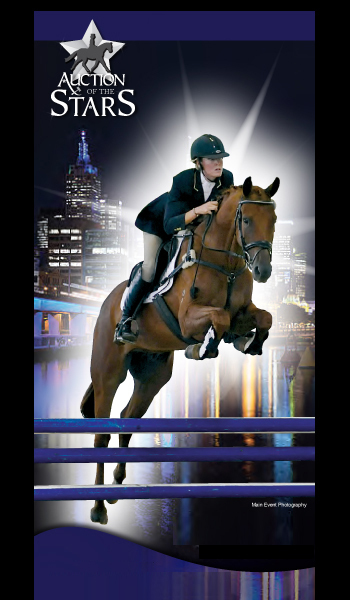 Breanna will be riding Fiji R at the auction in the stallion display on Saturday and the Masterclass on Sunday. Interestingly, on the dam�s side the Regardez Moi mare Regalia R was offered for sale as a weanling many years ago at the AOS auction in Victoria. Regalia R did surprise everybody in the auction with unexpectedly sensational movement. So much so that I (Heath Ryan) bid on her way past her reserve and bought her back. Who knows where Fireworks R�s movement has come from, there are plenty of amazing genetics there but the thing is who cares, here is a freak mover.